The Wooster Geologists have started the school year with our traditional Geology Club group photo on a fine late summer morning. We’re looking forward to an exciting time with healthy course enrollments and enthusiastic Senior Independent Study students. Dr. Meagen Pollock is on leave this year, bless her heart, so Dr. Greg Wiles, Dr. Shelley Judge and I have extra opportunities. Dr. Wiles is again our valiant Chair. This is also one of the biennial years we run our spring Mojave Desert field trip. 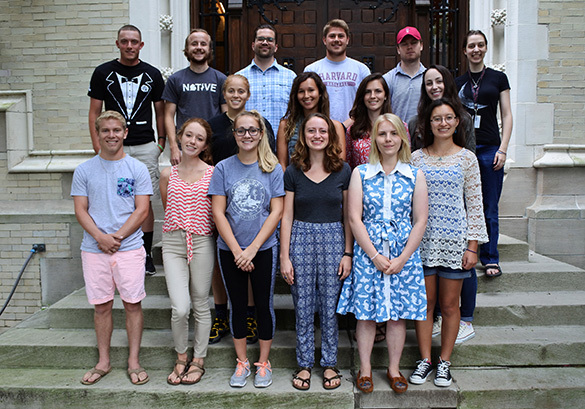 And here are those seniors, most of them anyway, with their summer data collections completed and their advising schedules set. You’ll be hearing more from them in this space. Our previous group images can be found at these links: 2015, 2014, 2013, 2012, 2011, 2010, 2009, and 2008. Thanks to our Administrative Coordinator Patrice Reeder, our 2016 annual report is available online as a pdf. 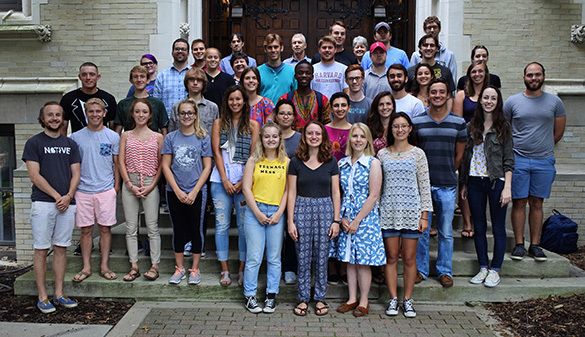 You can check out our curriculum, yearly schedule, faculty profiles and the like on our Wooster Geology Department pages.